Post Traumatic Stress Disorder: PTSD is a disorder that develops in some people who have experienced a shocking, scary, or a dangerous event. Post Traumatic Stress Disorder (PTSD) can be described as a mental health condition that’s triggered by a trauma. Whether experiencing it or seeing it. The symptoms include flashbacks, nightmares, severe anxiety, depression and confusion. As a 15 year old freshman girl I was at school on April 20, 1999 at Columbine High School in Littleton, Colorado when two students opened fire and killed 12 students, one teacher, wounded dozens and then killed themselves. For years I didn’t realize that what I was experiencing was PTSD. But I had all the symptoms. Flashbacks. Anxiety. Depression. Confusion. Nightmares. I used to think the only way someone could have PTSD was to have been a soldier at war. But now I know PTSD is so common and it can happen to anyone who has experienced a trauma. Although I was not injured at the school that day I did hear gun shots. I hid, I felt fear. I was confused, I was lost, I was angry. I felt as if I lost all control of my life. I felt anxiety. Going through infertility can bring up all those feelings, too. I know they have for me. There are all sorts of levels of trauma. There is the trauma of being in a school shooting (like myself) and then there is the trauma related to infertility, which I also experience. So what does my infertility PTSD look like? I have been blessed with two daughters through the miracle of IUI. But for ten years I have had dozens and dozens of doctor appointments, paid thousands of dollars in treatments, spent hundreds of hours with doctors, nurses, in the hospital or at the RE clinic. I have taken hundreds of ovulation tests, pregnancy tests and even more shots and pills. My stomach has been in knots as I’ve waited for important emails and phone calls from medical professionals, I’ve waited anxiously in nothing but a gown in a cold doctor’s office. I’ve felt the highest of highs the lowest of lows and have felt as if my world was crumbling down around me. I’ve grieved. I’ve wept in my bed for hours, and walked around like a zombie due to hormone medication that made me feel like someone I didn’t even recognize. It can be a traumatic experience to go through infertility. So don’t be surprised if at some point on your journey- whether that means you have been able to have children or you’ve come to terms with living childless- that there might be a time where you experience PTSD because due to the trauma you’ve experienced because of infertility. 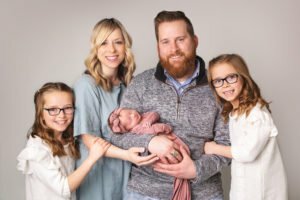 For the past four years we’ve tried to add another baby to our family. Two years ago we spent over a year going through two rounds of IVF. One year ago we decided to take a break and stop all treatment. That meant no more appointments, and no more going to my clinic. About six months ago I needed to go back to my fertility doctor to have her remove some uterine polyps. But first I had to have a pre-op appointment. That meant I would be going back to the fertility clinic for the first time in over a year. What I didn’t expect was to experience flashbacks just by being there. As I waited in the room for my doctor I felt like my heart was going to beat out of my chest. I started to feel anxious as if my body was shutting down. I just wanted to get out of there. I thought back to all the time I had spent there doing IUI’s and IVF and I felt hot and sweaty suddenly. Flashbacks. As soon as my sweet doctor walked in the room I burst into tears. I didn’t know why. I didn’t know what was happening to me- but my body was reacting to all the trauma- emotionally and physically that I endured in that office. My doctor was so kind and immediately acknowledged and validated that I had been through SO much there that now it was all coming to the surface. And then it clicked. 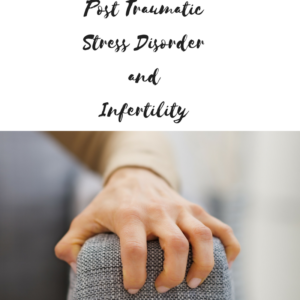 Because of the PTSD I experience because of Columbine, I realized that I too, was having PTSD symptoms related to infertility. It made sense. When I owned that thought and accepted it, I was able to embrace it. I was able to understand why I was feeling that way and it wasn’t so scary. I could say out loud to myself that it was okay to feel that way, to recognize what my triggers were. Humans are complex. Our brain works in mysterious ways. And you can’t always control what you consider to be traumatic or not. But the important thing is to understand what might be happening. Maybe for you it’s feeling anxious and depressed every year around the time you had a miscarriage. Maybe for you it’s breaking down and feeling worried and scared when you become pregnant after having lost a previous pregnancy. Maybe for you it’s every time you drive by your fertility clinic you have flashbacks of all the hours spent in that office. Or maybe for you it’s a feeling in the air, a smell, or a song that brings you back to the most emotional or traumatic part of your TTC journey. We all have our own “Columbine” in our life. Something that changes us. Something that alters our life. Something that strips us of our innocence and the way we once looked at life. Something that makes us put our guard up. Something that forces us to grow. From my own experiences with PTSD and what I went through as a child and what I’ve gone through with infertility I’ve learned that it’s okay to feel however I am feeling. It’s important to grieve and let it out. But it’s more important to move forward and to look for the good, too. That can be so hard to do, and there are so many stages of PTSD, but know that you are not a crazy person for feeling that way. Take care of yourself. Call in to work and stay home, hugs your kids and husband a little tighter, write in your journal, seek the help of a professional, meditate, pray- do something that helps you feel. Infertility, just like any trauma deserves to be validated. Never push away what you might be feeling, and don’t tell yourself that “it’s not as bad as what someone else might be going through.” Because remember- this is your journey- not someone else’s. This life is filled with so much beautiful and good. There will always be trauma and heartache sprinkled in between the happiness and joy. The events at Columbine happened 18 years ago. I may always have PTSD related to it, but as the years have gone on, the symptoms have lessened a little, or maybe I have learned how to channel them better. And I know as time goes on, I’ll learn how to do the same with the emotions and feelings I have related to my infertility.